Slaughterfish Scales are dropped by slaughterfish. 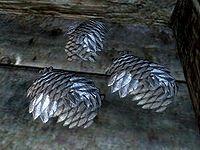 However, slaughterfish do not drop slaughterfish eggs—those are only found in egg nests. Slaughterfish scales are always dropped by slaughterfish. This page was last modified on 9 April 2018, at 06:21.